Retirement from vaudeville was often a residence in the San Fernando Valley, and billing at a local supper club. June 12, 1898 Charles Fitzgerald aka Charley Foy was born to vaudeville father, Eddie Foy, Sr. whose surviving children formed the “Seven Little Foys” on stage. In 1913 Charles Foy made his film debut. He went on to make forty films, but continued in vaudeville until 1936 when he relocated to Hollywood. He appeared in films that featured Bogart, Gable, Harlow, Hope, and Reagan. During the 1920s he attempted to get Ginger McMath (Rogers) on stage, but a Texas stage manager did not like her dancing. Foy was surrounded by wonderful vaudevillian story tellers many who could not read or write, and may have valued a good story on a higher plain than accuracy of time and detail. Accordingly, a plethora of misinformation has been published about his life, and the Charles Foy Supper Clubs. 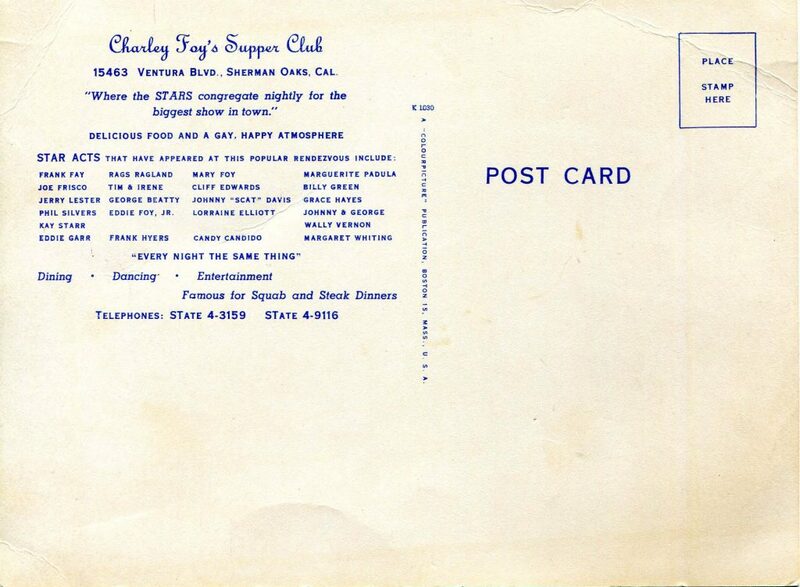 This author’s research from newspapers reveals the Charley Foy’s Supper Club may have first existed on La Brea in the late 1930s. By May 30, 1941 it advertised acts at 12915 Ventura Boulevard in Studio City. Internet sources claim this location was founded January 1941 which does coincide with permits pulled during that period. The restaurant space was approximately 2,400 square feet before it was razed in 1980. Joe Frisco became a house regular at the Charley Foy Supper Club. A book about Joe Frisco claims Betty Davis came into the club the same night she received an Oscar. She won Oscars in 1936 and 1939. If this story is true the club either existed in early 1939 on La Brea, or this occurred at the Grace Hayes Lodge located at 11345 Ventura Boulevard in Studio City. Sources claim A-list actors came to Foy’s clubs to relax. Reliable sources indicate at different times Jackie Gleason and Dan Rowan were regulars on Foy’s bill. Foy’s sister, Madeline Foy (Mary) helped run Foy’s clubs. In 1946 the club moved to 15463 Ventura Boulevard, Sherman Oaks. This location may have once been a house. A building addition for this address first occurred in 1933. A 1936 newspaper advertised for a houseman at this address. It is unclear whether Foy shared an upstairs room with Joe Frisco at 15463 Ventura Boulevard, 12915 Ventura Boulevard, or maybe even 11345 Ventura Boulevard. Frisco was quite a character. Although he could not read, his dance moves are mentioned in the Great Gatsby. Incidentally, Fitzgerald died in Encino and so did Al Jolsen who toured the Palm Springs vaudeville circuit with Frisco. During Frisco’s at least fifteen year residence at the Charley Foy Supper Clubs, Foy had to pay him mostly in cash because by this time he was seriously indebted to the IRS. According to the American Vaudeville Society, later in Frisco’s life IRS agents and bookies lined up after his performances to collect. 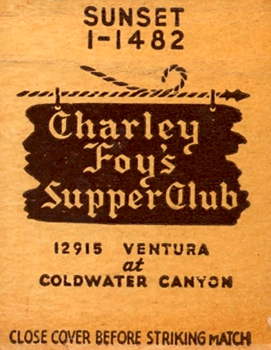 The Charley Foy’s Supper Club existed at 15463 Ventura Boulevard until 1956. Joe Frisco died in 1958. 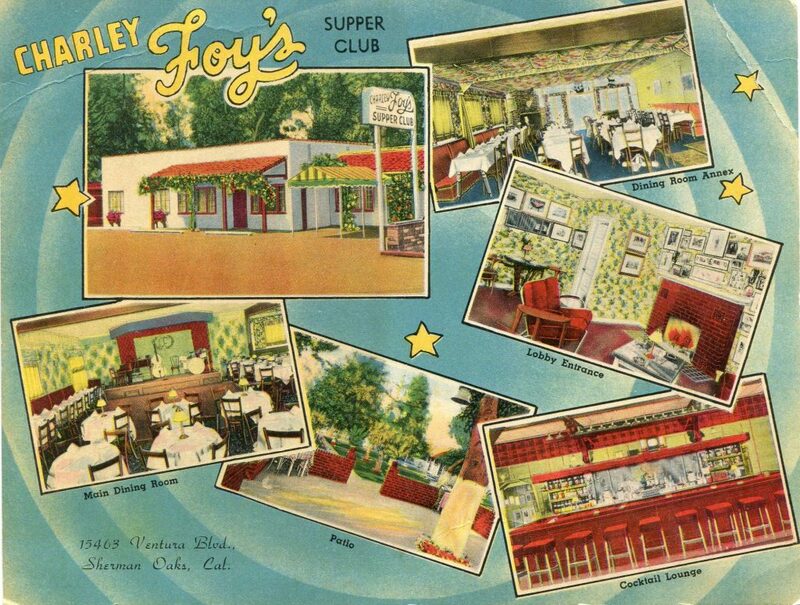 A number of dining establishments graced 15463 Ventura Boulevard after Foy’s club closed. 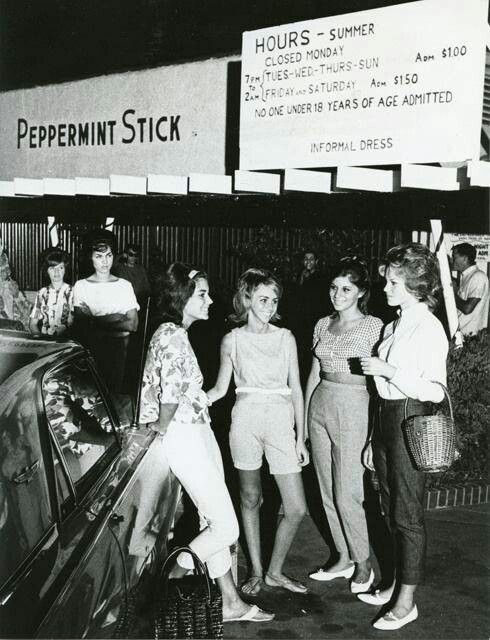 The most memorable was the fairly short lived Peppermint Stick which opened May 5, 1962 allegedly to serve as a legitimate place for teens not to act delinquent. Whether the moniker Peppermint Stick inspired the naming of the Cinnamon Cider Club (11345 Ventura Boulevard where the Beatles were brought in 1964 for their first American press conference and records show Foy and Frisco performing at during 1939), or the Cinnamon Cider’s name inspired the Peppermint Stick is not presently known. KRLA DJ Bob Eubanks, who later mortgaged his Hidden Hills home to produce the Beatles’ Hollywood Bowl show in 1964, also opened the teen night club Cinnamon Cider in 1962. The Peppermint Stick was opened by San Fernando Valley Chiropractor David Rosen. 15463 Ventura Boulevard continued as a supper club or restaurant until at least 1973. October 10, 1975 a permit was obtained to demolish the building. By the early 1980s the author remembers a vacated women’s gym at 15463 Ventura Boulevard that appeared to be destroyed by fire. In 2003 a newly constructed assisted living center was completed at this location. Charles Foy died August 23, 1984, a married Woodland Hills man. His sister died in 1988. 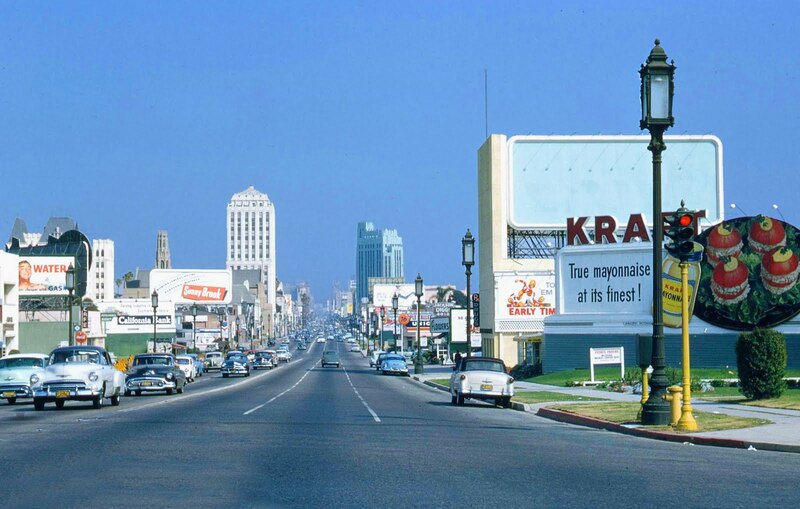 Supper Clubs dotted Ventura Boulevard through the 1970s, and continued to exist off of Ventura Boulevard until the 1980s. Las Vegas, television, and the ability to see movies at home killed the scene. The research for this article, besides what was already known to the author, took more than twenty hours due to multiple inaccurate sources and the need to use reliable data.